Simply fill out the following form to get your child registered. 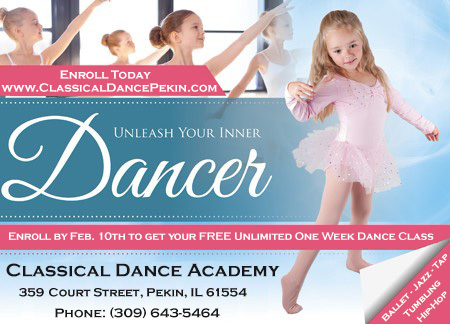 Sign-up before February 10th and receive a FREE Unlimited One Week Dance Class Pass. Located in the growing downtown business district of Pekin just across from the Tazewell County Courthouse, Classical Dance Academy is very exited to offer a wider selection of classes and programs then ever before. A new floor has been installed, fresh paint and new mirrors are up, and a fresh new goal of fulfilling your child's dream of dance. If you haven't seen us lately or you're curious about our Academy, stop in and have a look around. We're excited and we think you will be as well! Copyright © 2015- Classical Dance Academy. All Rights Reserved.